Often times, we struggle to find outlets for our creative energy. It happens when we fail to recognize that we actually have any creative energy within us. It happens when we find a way to overcome our mental blocks. But we naturally feed off of the environment that we place ourselves in and from the people around us. So when you find yourself in the right place with the right people, those outlets seem to naturally appear. Late last month, playwright and filmmaker Richard Montoya, a member of the iconic Chicano comedy troupe Culture Clash, a hosted a meet up at Cities Restaurant in East LA of individuals from various sectors of life to create a dialogue around ideas and create synergy among those who who are attempting to use their creativity as an agency for change and empowerment within our community. The event was sponsored by Red Bull, but aside from an acknowledgement that they received at the beginning of the dinner program, you would not have known that they were involved. No banners. No logos. Just a few Red Bull cans used at the bar for the mixed drinks being served, as would be the case in any bar. The Red Bull representatives were there to listen to us and learn from us, to see how we tap into our creative energy, how we use it and what motivates us in our work. That is the premise behind “Hacking Creativity,” a Red Bull initiative that aims to spark the creative side in all of us and see how we can use our creative potential to address pressing issues that are impacting our society today. It is an initiative that can well leave a lasting global imprint, affecting the world in ways that we would least expect it to. From the performing and visual arts to science and politics, the ability to tap into our creative sides is more critical than ever, as we find ourselves needing to find uncommon approaches to address our common needs. If you had happened to glance across the room, you would have seen a diverse group that represented the melting pot that is Los Angeles, both in terms of its cultural and creative diversity and in its multi-ethnic composition. Even though most of the people in attendance were Latinos, the backgrounds and experiences present in the room showed that our social boundaries encompass the globe and that our creative minds range fully across a broad spectrum of what moves our society forward. The creative wealth in the room was a bit overwhelming, but more so inspiring and motivating. The spirit of the event was not only conveyed in our conversations but also in our meal, a combination of six carefully prepared platters by Executive Chef Melissa Zuniga and her team. 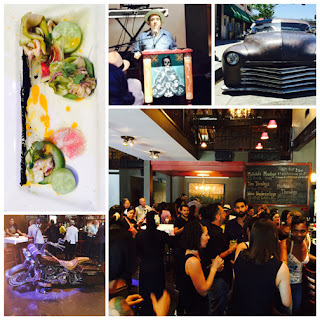 Each dish served as a tribute to the East LA community in which we were meeting. From the Jewish roots in Boyle Heights to the pocket Japanese and Chinese communities in East LA to the Mexican immigrants who are now at the foundation of today’s Eastside, every meal gave us an insight to the heartbeat of the lives of that traversed Avenida Cesar Chavez when it was once Brooklyn Avenue. As the dishes were served, attendees were encouraged to introduce themselves to those who they did not know, talk about the work that they do and share in the ideas that we each brought with us that we felt would contribute to our joint efforts to improve how we tap into our creative sides. So as we nurtured our bodies with the food on our table, we also nurtured our souls through our exchange of ideas. I felt that feeling as I was seated next to an individual who has made their mark in society by ensuring that they get to share their creativity with others, despite the efforts by others to suppress it. Harry Gamboa, Jr. is an icon within the world of performing arts, conceptual art and experimental hybrids that fuse both. As one of the founding members of the Chicano art collective ASCO, he found himself fighting a world of racism and prejudice as he struggled to find outlets for his creativity. He was born into a world where Chicanos and Latinos were not readily embraced by many of museums and art institutions that purported to be arbiters of culture and fine art. Even now, we often find ourselves facing similar battles when it comes to making our voices heard and making our opinions matter. So when he, along with the other members of ASCO, spray painted their names to the outer walls of the Los Angeles County Museum of Art after their artwork was turned away by the museum’s curator, they empowered themselves in the manner with which they needed to. As I left the event, I realized that “Hacking Creativity” is a philosophy that would have a profound impact all around us if only we embraced it as a way of life. We would be empowered to build more bridges of innovation rather than walls of suppression. We would inspire others to be vehicles of change rather than being tools of oppression. When we hack our own creativity, we accomplish exactly that. Ulisses Sanchez is a consultant and digital marketing strategist. He can be reached via email at ulisan98@gmail.com.